�	Diabetes and hypertension are the most common causes of ESRD: 77% at 1 year to 9% at 10 years. Aortic pulse wave velocity (PWV) and more significantly Augmentation Index (AIx) are known predictors of morbidity in ESRD patients on haemodialysis. These values provide information into mortality and risk independent of other known risk factors. In a patient study group of ESRD subject, an increase of 10 in AIx (%) produced a 5% increase in the risk of cardiovascular and all-cause mortality. In addition, any increase of PWV of 1 m/s showed a subsequent 39% increase in adjusted overall mortality. The characteristics of this patient group included ranges for AIx of 26 �15 and PWV of 11.7 �3.0 m/s. All of these findings were independent of other known risk factors including brachial BP. While increased aortic stiffness (PWV) and systemic arterial stiffness (aortic Augmentation Index � AIx) have readily been shown to correlate with other conditions prevalent in patients with CKD, hypertension, diabetes, atherosclerosis and hypercholesterolaemia there is less documentation linking arterial stiffness to high rates of cardiovascular death in CKD patients. Recent studies do indicate that arterial stiffness is associated to pre-dialysis CKD patients with mild renal impairment. As well, it has been shown that increased arterial stiffness is associated to the decrease in renal function as evidenced by decreasing glomerular filtration rate. The relationship between alcohol consumption and cardiovascular risk is �U�-shaped: heavy drinkers and non-drinkers are at the high end of the risk while moderate drinkers are in the middle, with lower risk. This same relationship exists between alcohol consumption and arterial stiffness. For example, moderate consumption of red wine in patients with coronary heart disease produces favorable effects to central systolic pressures and wave reflections with no changes to brachial blood pressure. Interesting to note is that a similar result was observed with non-alcoholic red wine. The study, therefore, demonstrates the necessity of measuring central pressures as compared to conventional blood pressure while assessing the risk potential of various substances. Pregnancy produces a host of physical changes in a woman�s body including changes to the cardiovascular system. It is not uncommon to develop hypertension while pregnant but the condition can lead to major complication for mother and child if eclampsia develops. Identifying and distinguishing between gestational hypertension and preeclampsia is a measure easily accomplished by the PWV System. In addition to these important analyses, the PWV System provides valuable insight into a patient�s ability to adapt to pregnancy-related vascular changes. These readings give doctors a broader assessment of health which leads to better risk management and monitoring during pregnancy. Customized drug treatment programs have been shown to decrease arterial stiffness in patients with cardiovascular disease, including diabetics. These timely pharmacological interventions have been shown to be effective independent of changes in cuff blood pressure. While insulin has been observed to decrease AIx independent of peripheral vascular resistance, this effect is not present in diabetics (Type 1 or Type 2) or obese patients with insulin resistance. Pharmacological interventions which have proven successful in decreasing arterial stiffness include the oral administration of ascorbic acid over a 4-week period. 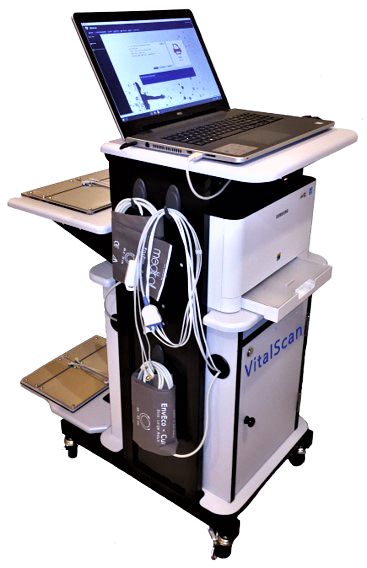 Using the PWV System, doctors are able to monitor the efficacy of particular drug regimens by measuring changes in central cardiac parameters. This application assures physician�s a reliable patient risk assessment and accurate measure for tracking treatment and managing patient health. The arterial pulse in infants shows the same contour in central and peripheral arteries. This finding is similar to what is observed in the elderly. While the amplitude of infantile arterial pulse is low, it shows no secondary wave in diastole and the wave�s peak is observed in late versus early systole. As subjects grow into adolescence, the contours observed in arterial begin to change. The peripheral pulse is amplified, the wave peak shifts to early systole and the secondary diastolic wave is now obvious during early diastole. These changes to the pressure wave contribute to the significantly higher peripheral pulse pressure and systolic pressure experience in late adolescence versus infancy. The similarity in pressure pulse waveform between infants and the elderly can be attributed arterial structure and its effect on wave reflection. In infants, wave reflection from peripheral to central vessels is short due to their relatively short length of the infant�s body, even though the aorta is very compliant at a young age. In the elderly, body length isn�t the significant factor; however, aortic stiffness produces the same effect on the reflected wave velocity. Despite their short bodies and quick heart rate, infants show a relatively long LV ejection period. During research, animals of similar size and heart rate indicate a significantly shorter LV ejection rate and secondary reflected waves are noticed in diastole versus systole. Dating back to Mahomed�s initial observations, age has been found to be significant factor in arterial pulse. Kelly et al. have conducted extensive research on this arterial pulse in normal subjects. Findings show an increase in the late systolic pressure peak in both the radial and carotid arteries. This observation is coupled with the loss of the secondary diastolic pressure wave. In addition, the late systolic pressure wave is found to be lower in the radial artery that in the carotid, regardless of age. Similarly, it has been found that readings from the ascending aorta taken at the cardiac catheterization show the same pulse wave patterns however, late systolic augmentation is greater in the carotid and even more so in the radial artery. Both the pattern and duration of ventricular ejection are affected by heart rate. This, in turn, leads to changes in the contour of the arterial pressure wave as well as the summation of reflected waves as produced during ventricular ejection. It has been found as heart rate decreases, augmentation increases (through an increase in the ejection period) and as heart rate increases (and ejection period shortens), augmentation decreases. This effect, as studied extensively by Gallagher and Wilkinson et al., is attributable for the 4% approximate decrease in aortic augmentation per 10 beats minx1 increase in heart rate during cardiac pacing. Heart rate has also been found to increase amplification of the pulse wave between aorta and peripheral arteries due to the higher amplification of individual harmonics at frequencies near 5�6 Hz. The transfer function of the PWV System allows for this while assessing the ascending aortic from the peripheral pressure wave at various heart rates. The most significant factor is arterial pulse is ageing. In all human subjects, aortic pulse wave velocity gradually increases with time as does the progressively early return of the reflected wave. This results in the secondary wave in diastole moving into systole with greater augmentation of pressure in late systole. Late systolic pressure augmentation, caused by early wave reflection is attributable for a 40�50 mmHg boost to systolic pressure in central arteries. At the root of aortic stiffening is the fracture and fragmentation of elastic lamellae within the media. Progressive aortic dilation occurs when stresses are transferred from the elastin in arterial walls to less extensible collagen areas, producing an increase in stiffness. The phenomenon causes a disorganization and dilation in the aorta and arteries in regions of �medionecrosis�. This generalized degeneration of medial elements in elastic arteries is referred to as arteriosclerosis. This disease produces a progressive increase in pulse pressure and systolic pressure, otherwise known as isolated systolic hypertension. Since distensibility of the brachial artery its radicles is a factor and transfer function doesn�t vary considerably with the elevation of arterial pressure, the transfer method persists as a valid method of generating central to peripheral pressure in the presence of hypertension. Todos los resultados y análisis deben considerarse en el contexto de la historia del paciente/candidato, síntomas, medicación actual, planes de tratamiento y terapias.